We have friends that live part time in Seattle and part time in Singapore. Last year Yu Sian traveled with me to Laos and mentioned the World Gourmet Conference that takes place the first of May each year. When there is an invitation I hate to miss the opportunity so I took Yu Sian up on her offer. I arrived for an amazing week of eating and exploring. We did more in one week than I have space to write but here are the highlights. The restaurant is in the Metro Mall, in the rear of the Paragon Mall, as are most restaurants. Today we had dim sum for lunch however, we returned the last evening for the best peking duck served 3 ways. 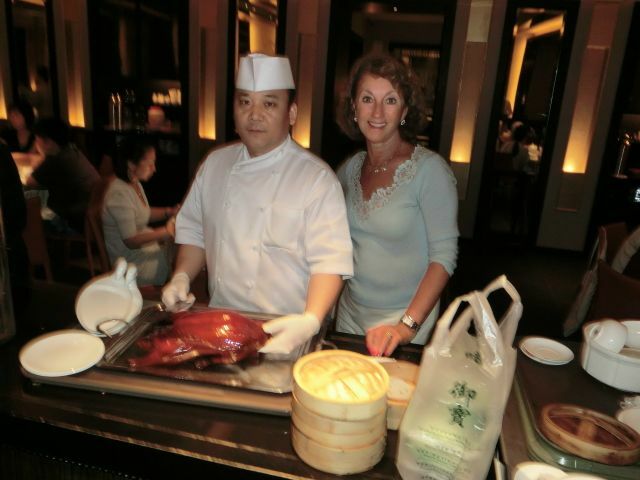 Do not miss this treat, my host Boon Woo believes this is the best Peking Duck in the world. That first evening we went to dinner at Long Beach King Seafood– this is a very casual place with huge tanks of fresh crabs and fish. 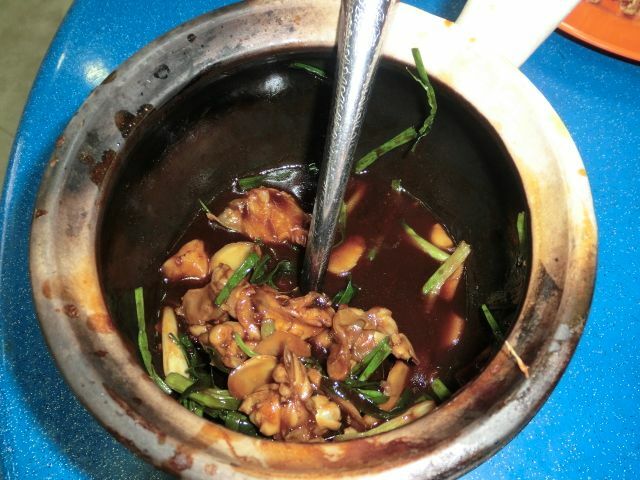 We had the special Chili Crabs, they serve a local mud crab with one larger claw. They also had live Alaska King crab, $700.00 sing dollars for one crab course. We shared the local crabs and they were great. Early the next morning we had a walk through the gardens and headed to Bacchus in Paragon Square to buy some Champagne for later. A good asian restaurant for an early lunch was located in the basement of this mall, Din Tai Fung makes perfect dumplings. We also now have the same dumpling restaurant in Bellevue, Washington. That evening we stayed in and were joined by several of their friends for a wonderful traditional dinner around their table. durian was the surprise for desert. If you can get by the smell and that ugly skin the soft fruit inside is very nice, I believe a learned taste. Boon Ho, Yu Sian’s husband, took us for lunch on Sunday at the new “Sky on 57” restaurant at Marina Bay Sands hotel and casino. 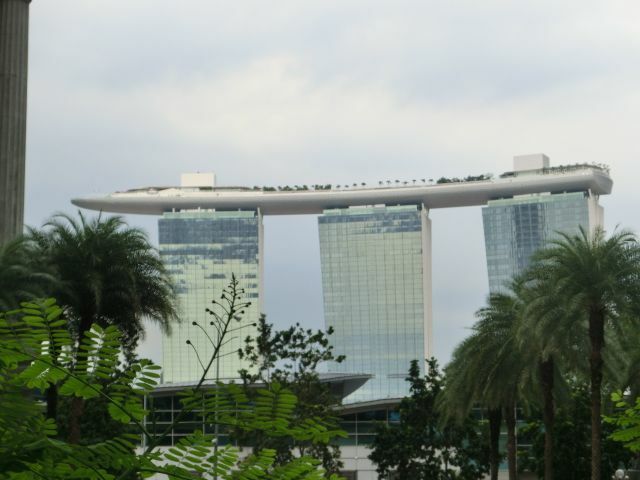 skyon57@marinabaysands.com. This is a very upscale restaurnat serving local cusine. 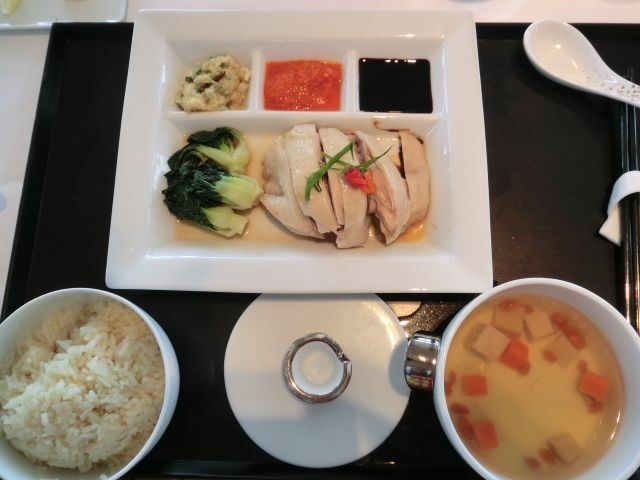 I ordered the local version of chicken rice, not like what you are served in street food. Next to the restaurant is the new pool that has an infinity edge 57 stories above the city. Worth a visit. legs cooked with ginger garlic sauce to start. The sauce was rich with flavor and very tasty. Next arrived a plate of Zhichar, stir fry beef with rice noodles with black beans. Followed by a plate of small clams in a chile sauce, way to much chili. Next morning we headed out to the famous Orchard Road to shop. It is hot and humid there so all of the shopping happens in very high end office type buildings or hotels, each different mall taking the first 5 or 6 floors of the building. Connecting the building is a maze of underground passage ways. Every major retailer from Gucci to Todd shoes is represented and each mall has a large selection of great restaurants, gourmet grocers and food stalls. While my hosts were working I made good use of my time to visit the local museums, wander the shopping areas and get back to the house for the next food adventure. One of my favorite stops was the Peranakan museum. This is a small museum but so full of history I had a hard time leaving, a must. The National Museum of Singapore was a good place to spend time out of the heat of the city. Then I was off to my last stop Asian Civilsation Museum, across from the Fullerton Hotel, the original post office now converted into a grand hotel on the Singapore river. The first wine dinner we attended was held in a new restaurant called ‘Gaia” chef Luisa Valazza from a 3 star restaurnat in Alba, Al Sorriso , prepared a 5 course meal paired with Pio’s wines also from Alba. After all, the reason I came to Singapore was to attend the dinners and cooking classes offered by the Gourmet group. Next morning after our walk we headed to Little India for vegetarian Dosa at a small place called Komala Vilas, they have 3 locations but we went to #76 Serangoon Road across from the Indian market. Our perfect dosa’s were around $3.00. Great way to start the morning. After a quick change we were off to cooking class. The class was taught by a Japanese chef and he showed a couple of simple chicken dishes, not sure I would recreate at home but some interesting technique. I do not believe the classes offered were really that great however, the experience was worth the time. We had a quiet dinner at home with the best bowl of “Laksa”, I will ever eat. Laska is a bowl filled with noodles, fresh coconut juice squeezed from the meat of the coconut and beautiful shrimp. I perfect way to end any day. If you are in the region be sure to have Laksa, I am sure it will not be as good as what I was served but a must. The next morning we went to China town and shared the traditional morning fare with hundreds of others in one of the food halls that are found all over the city. Most of the people live in apartments and have little kitchens so eat many of there meals in the huge food halls located in their neighborhoods. I chose to have a plate of noodles with fresh BBQ pork and a bowl of broth on the side, about $3.50. I had to try the hot ginger tea, a lot of ginger but I loved every sip and I am sure all my health issues were taken care of with that one cup of tea. I made a stop at the Chinatown Heritage Center and spent time just walking through the rooms and understanding what the immigrants 100 years ago went through to find a new better life. Boon Ho took us to a new upscale restaurant called “Otto” located at 28 Maxwell Road in The Red Dot Traffic Building, the old traffic police station and jail. Otto is restaurant that draws a large business crowd. Last week we flew to New York for a quick 5 days of eating and exploring. We stayed at the Plaza Hotel, which has been all updated, our junior suite was complete with a Round bed. We have never slept in a round bed, interesting. Our first night we had a late dinner at Dovetail, 103 West 77th St. Interesting American food with a twist. The soft shell crab Carl, my husband had, was perfectly crisp with a simple fresh peas puree under with a hint of lemon zest. The courses were the right size to enjoy without being to full. The wine list had a broad range of vintages and wineries represented. I recommend Dovetail for anyone interested in seasonal dishes prepared to perfection. We woke up to a warm morning and after a quick coffee headed to our new Sur La Table store on 76th and 3rd ave. The store was busy and fitting into the neighborhood well. From the store we jumped on the subway and headed down to Soho to visit our store on Crosby Street. Time for lunch and we took advantage of a friends suggestion for interesting Asian twist at MOMOFUKU at 207 2nd and 13th. Worth the try. Back to the round bed and a quick drink in the Oak Room at the Plaza before we dashed off to see Spider Man. We both agree that it is worth the evening entertainment to experience the flying cast and wonderful spoof on New York. Always a good late night feast at NOBU on 57th street. We had a wonderful waiter and one dish after the next was unique, of course we had to much food but the scallop dish had to be added. Next morning we headed to the now famous “Eataly” Mario has a hit on his hands. the space takes up half the block and each corner offered a different opportunity to taste a bit of Italian specialities. there are 4 different places to sit and eat, pasta, sliced meats salads and more. The take out looked great and of course the hundreds of people walking through gives energy. Not sure how much was being bought but it was worth the visit. Eataly—200 5th Ave at 23rd. We did not eat at Eataly but headed down to Tribeca for lunch at a fun cafe called “Bread at 301 Church, near Walker.” I believe I had some of the best carpaccio I have had in years. We walked around explored the ground zero and took the subway back to the hotel for a rest before our dinner at Marea. Owner Michael White has introduced Italian food at a new level, light, local, fresh ingredients especially focused on fish. Every course was well presented and the wine list was amazing. There is not a bad seat in the restaurant it is just getting a seat that is hard. Call ahead 212-582-5100. The last night we headed down to —-Imperial #9 —in The Mondrian SoHo Hotel. The front room which is a glass greenhouse type room is like being invited into Alice In Wonderland’s house. The concept is samll plates to share and each one came to the table making us think that the next one could not be as good as the last. Make a reservation and go not only for the good food but the people watching. Don’t forget to order the grilled fresh Alaskan King Crab legs. Enjoy the city on your next visit we sure did.